Well, the jeans circle quilt still isn't done, but Lacey is pleased to point out that I've now got all the colored pieces arranged to my liking. It took several days, partly because I wanted to let it rest (kind of like bread dough) for a day or so and then look at it again and rearrange a few pieces. I did that process a few times until I was happy with it (or sick of it, anyhow!). If you look in the upper right corner of the picture, you can see the baby fence I put around the quilt to keep Lacey off it. It was totally useless; the moment I opened it to go in (I'm too short to climb over easily), she was right there in the middle of the quilt, waiting to have her picture taken! Now I'm slowly pinning in the batting pieces as I watch the Olympics on TV (one of my current distractions). One of my other distractions recently has been playing with shibori itajime dyeing (Japanese tie-dyeing with clamps or objects clamped to material). 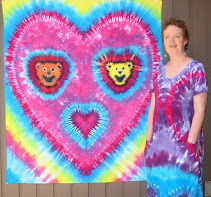 I did a fair amount of shibori work, including stitch resist, binding, and clamping, when I first started doing tie-dye, and off and on ever since. I love the possibilities it provides, and I especially love the surprises that result from folding and clipping the fabric in various ways. Here are a few of the experimental "play" pieces I did a few days ago. With the shooting star and the butterfly I'm experimenting with using shibori in a more representational manner. By the way, if you are interested in any of the baby rompers, I've got them in my Etsy shop at http://amethistle.etsy.com. Much as they liked these, my own kids outgrew such things ages ago, and I'm working through my stash of white blanks. Sorry, my husband has already nabbed the big T-shirt! I've got all the colored fabric squares cut out, as well as all the squares of batting (lots of them, since I decided to use a double layer). I've got my new red thread for sewing it all together. Now I'm on the long step of figuring out where each colored square goes in the overall quilt, since each square is unique (the nature of tie-dye, of course). I expect this phase will take me several days, and the sewing will take another several days. Of course, that doesn't even count the pinning: 221 squares, at least 4 pins per square--I think I'd better go get some more pins! I'm throwing out a lot of them, too, since the pins are bending easily as I force them through all the thick layers of denim and batting. The sewn-together-and-ironed-over circles look pretty good, but I have a minor case of "blank canvas syndrome", where I just can't decide where to start! Now I can move forward, since I have an initial design to work from or work against (mine is likely to be completely different, but hers gives me something to rearrange). In the meantime, I'm getting a little too much help from Lacey! I guess it's hard work being that cute all the time!